Place the pickles in a food processor. Pulse 1-2 times. Add the remaining ingredients. Pulse until smooth. Refrigerate 1-2 hours prior to serving. Notes: reduced fat sour cream and Neufchâtel are fine in place of full-fat sour cream and cream cheese. If you don't have a food processor, finely mince the pickles and mix by hand. I love pickles. I can them all the time but cucumber pickles can be tricky-despite being the obvious go-to pickle variety, home canned pickles are often a little floppy and tricky to flavor. I don't know what it is; I like the ones I've made and they taste great but more often than not when I am looking for a cucumber pickle I just buy store bought. The fact that pickling cucumbers are oddly tricky to find in large enough and cheap enough quantities to have it make sense to can myself well, I'd rather just pickle something else 90% of the time. So when Vlasic asked if I'd be willing to develop a recipe using their Farmer's Garden variety which were already a particular favorite of mine, I was happy to do so. They are shelf-stable (not found in the refrigerated section) so I was initially skeptical when I tried them a few months back but I was won over. They feature locally grown cucumbers, whole cloves of garlic, carrot slices and peppers in the jar which gives them a homemade flavor. I wanted to create something fun and July 4th-picnic-worthy so I came up with this dip. 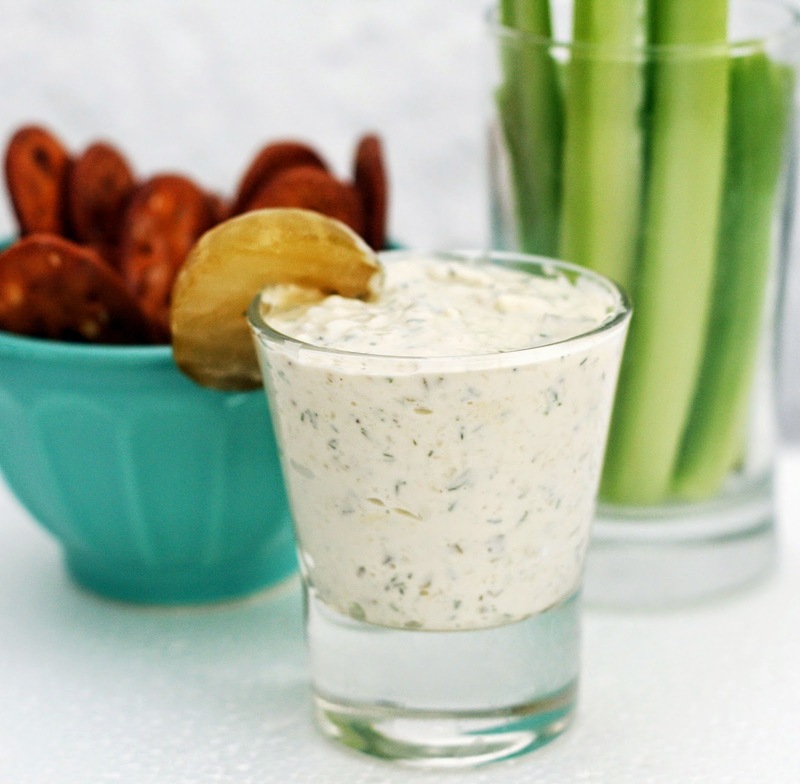 It is the perfect dip for pickle lovers who like me frequently snack on pickles and the more casual pickle-eater like my husband who loved this dip! I had never had or heard of pickle dip before but why not! I made it super dill-y by using the dill chips and fresh dill and the flavor is sort of like an extra dill-flavored ranch. Yum. Vlasic is doing a contest now, click here to enter! 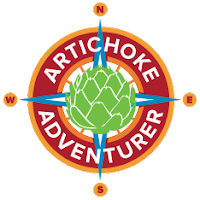 And try the pickles themselves using this $1 off coupon. Place the yolks and crawfish in a mini chopper or food processor. Add the mayonnaise and mustard. Pulse until nearly entirely smooth. Stir in remaining ingredients. Pulse one to evenly distribute in the egg mixture. Divide evenly among the halves. Garnish with crawfish. You all know how much I love deviled eggs! 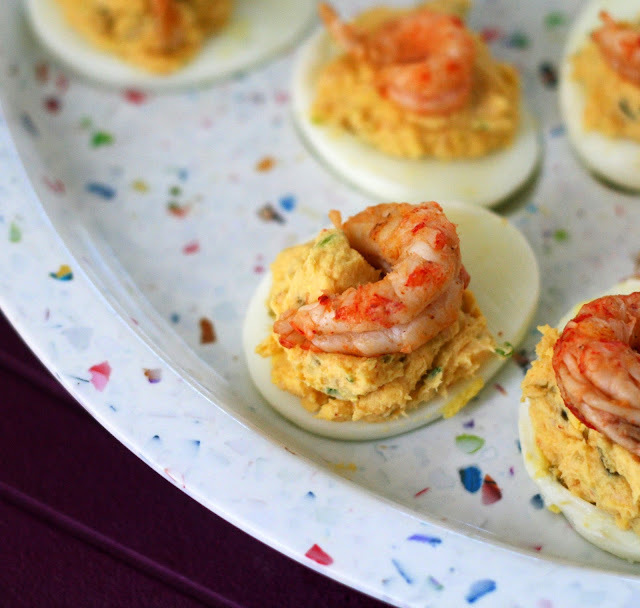 I had a bit of crawfish leftover and made them into these tasty eggs. It sort of pushes over to the "stuffed egg" territory versus a traditional deviled egg. Perfect for a picnic! Heat a small amount of canola oil in a skillet. Add the celery, onion, garlic and pepper and saute until the onion is soft and translucent. Allow to cool 5-10 minutes. Scrape into a medium bowl and add the remaining ingredients. Stir to combine. Form into flat patties. Refrigerate 30 minutes. Heat a small amount of oil in a skillet. Cook each patty 5-8 minutes, flipping once, until lightly browned on each side and warmed through. *I used crawfish tails leftover from a crawfish boil. If you are using fresh/frozen unflavored tails, toss in some Cajun seasoning. I keep hearing the Elvis song in my head every time I try to write this post. Crawwwwwwfiiiiiish! 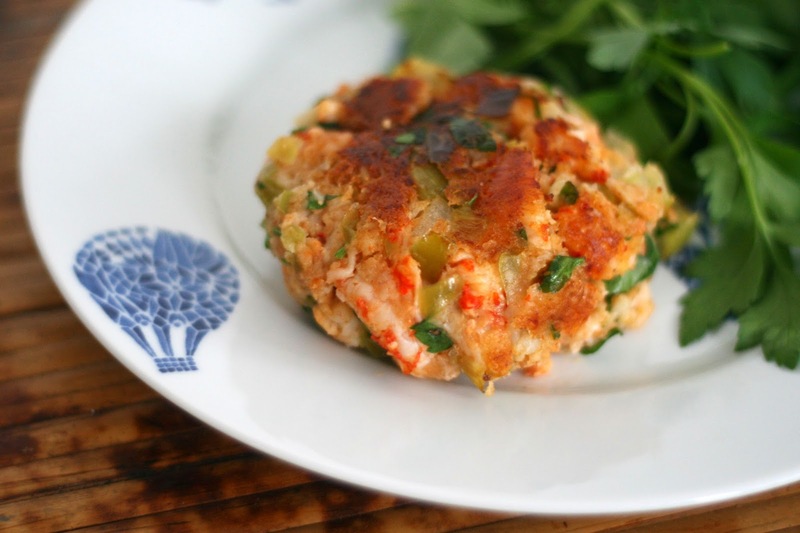 These crawfish cakes are light and fresh with a bright crawfish flavor. There is nothing worse than a crab cake that doesn't taste of crab so I figured the same was true with crawfish cakes. I kept the ingredient list short, simply my version of the "holy trinity" (peppers, onions and celery) with flavorful cubanelles filling in for bland bell peppers and some flat leaf parsley for a bit of punch. I served these with a remoulade sauce (recipe to come) and eggplant salad. Heat a small amount of canola oil in a skillet. Add the celery, onion, garlic and pepper and saute until the onion is soft and translucent. Allow to cool 5-10 minutes. Scrape into a medium bowl and add the crawfish, mayo, and cheese. Stir to combine. Set aside. Slice the bread in half the long way. Scoop out some of the middle of each halve. Fill with crawfish mixture. Sprinkle with additional cheese if desired. Place over hot coals on a grill and cover and cook until heated through and the cheese melts (about 10 minutes) or bake for about 10 minutes in a 350 oven. Serve immediately. *I used crawfish tails leftover from a crawfish boil. If you are using fresh/frozen unflavored tails, toss in some Cajun seasoning. Mine were well-seasoned already. We have been crawfish crazy this weekend thanks to Cajuncrawfish.com which sent us 30 lbs of live crawfish so we could have a crawfish boil. Oy! I have never seen so many crawfish in my life and they were clanking away in the giant pot we bought to cook them in. Living in Baltimore, I'd never cooked live crawfish (much less eat them more than a handful of times) before but it was quite easy and the results were delicious. 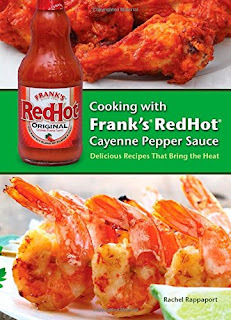 We planned it to have lots of crawfish tails leftover to create new recipes with. It was a little daunting peeling 30 lbs of crawfish but honestly (and don't kick me out of Maryland for saying this) it was much easier and quicker than picking crabs. We had all 30 lbs done in about 2 hours including eating and talking time. Not bad! We lucked out and had lovely weather too; it had been dreadful all week so I was worried. This bread was the first thing I made with the leftovers. It is sort of like chunky crawfish dip stuffed into bread. YUM! I grilled ours because we had some coals ready but I did try it in the oven and it worked just as well--you just miss the smoky flavor the charcoal gives you. Bring a large pot of salted water to boil. Add the potatoes and cook until fork-tender. Drain. Add butter and toss until the butter is melted and the potatoes are well-coated. Toss with dill, sprinkle with sea salt. *I cut mine up with my herb scissors, so much easier than chopping! A major holiday in Sweden is Midsommar (midsummer). Celebrated at summer solstice, it is celebrated by eating pickled herring, new potatoes and strawberries and drinking way into the night. In some areas of Northern Sweden it is light for nearly 24 hours! There is also dancing, singing and flower-crowns to be had. Here is it just the longest day of the year, which is much less fun. This year we happen to be in Philadelphia on the solstice and we are planning on celebrating it at Midsommarfest at the American Swedish Historical Museum, weather permitting, of course! We've been to their St Lucia festival but this will be our first time at Midsommarfest. I hear there will be a maypole! 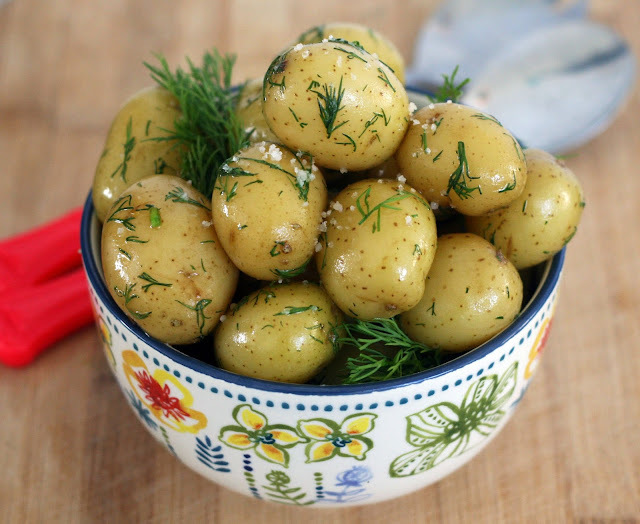 New potatoes are a typical dish served at midsommar parties, often tossed with fresh herbs, as they are in season and midsommar is all about celebrating the new summer season! Tossed with dill and some flaky sea salt I brought back from Portugal, this was a light yet filling side dish perfect for a summer evening. Glad Midsommar! Preheat oven to 400. 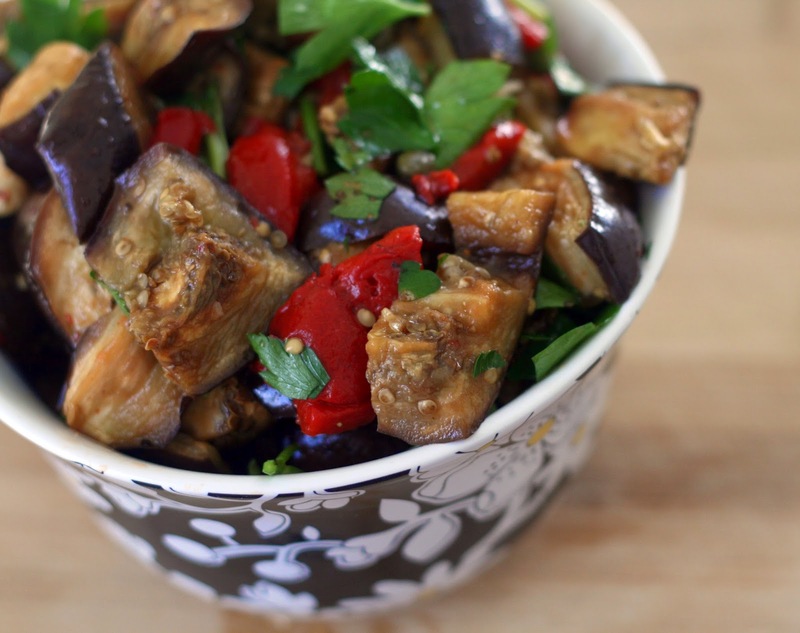 Place the eggplant in a single layer on a parchment lined baking sheet. Drizzle liberally with olive oil and sprinkle with salt. Bake for 30 minutes or until tender. Cool completely. Place in a large bowl, add remaining ingredients (no additional salt!) and stir to evenly distribute. Serve as-is or refrigerate 1 hour prior to serving to better meld the flavors. *I used my Joseph Joseph Rocker Garlic Crusher which makes tiny circular bits of garlic; perfect for this salad! It must be the very beginning of eggplant season because the eggplants around here have been lovely! I picked these two up and didn't have anything in mind for them then promptly left them in the fridge for a week. Oops! This is why I need to stop with the impulse produce purchases! Luckily they were still good when I re-discovered them but I thought I'd better make something with them quickly. Since it is once again super hot, I thought a salad was in order. I roasted the eggplant (relatively quickly and without making the kitchen too hot) transforming the eggplant into something velvety smooth and tossed it with a few other Italian-inspired ingredients. I used jarred red peppers because I actually like the texture and flavor of them better than homemade roasted bell peppers (I don't like bell peppers!) but if you have some home-roasted peppers, feel free to peel and use them. I loved it. It sort of reminded me of the marinated eggplant slices I like to get on Italian sandwiches but heartier and less oily. 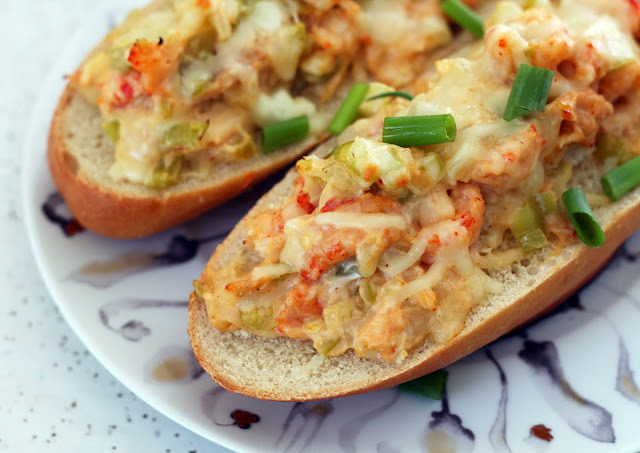 Perfect for serving with sandwiches, crab cakes (or crawfish cakes---recipe to come!) or even steak. It was just as delicious the next day so it could be made it ahead of time to bring to a picnic. Preheat oven to 350. Spray with baking spray or grease and flour one 8x8 inch baking pan. In a saucepan, melt the butter, cocoa and chocolate together over low heat. Stir occasionally, and when the chocolate is nearly melted, remove from heat. Whisk until smooth. Set aside. In a small bowl, stir together flour, salt, baking powder. In a separate bowl, beat together the sugar, eggs and vanilla until smooth. Slowly stream the chocolate mixture into the eggs and mix to combine. Gradually stir in the dry ingredients and mix until the batter is thick and glossy. Stir in the toffee bits and chocolate chips. Pour into prepared pan. Bake 30 minutes or until a toothpick inserted into the center comes out clean or with one or two crumbs. 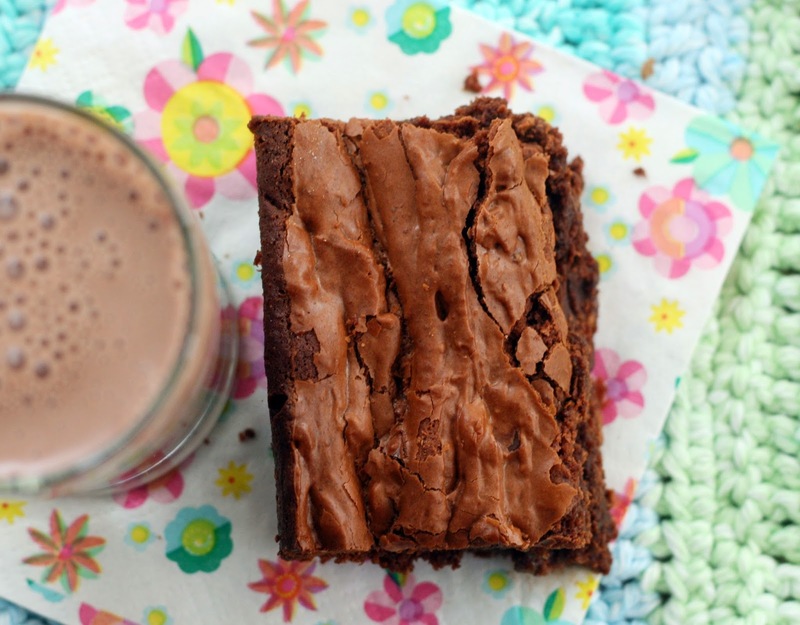 I've been craving brownies for some reason. Normally I am not a big brownie person but I couldn't get them out of my mind! Luckily I had all of the ingredients I needed here at home so I didn't have to head out during a torrential downpour. I had brought back a couple of bars of baking chocolate from Portugal so I used one. I love bringing things like that back from trips, it makes whatever I made seem more special. These brownies are chocolatey, chewy and delish all on their own but I admit, I snuck some gelato (love Talenti) on a square or two. It's summer! An aside: I always get questions about vanilla paste and I normally direct people to the grocery or baking goods store but I have to share a deal with you. I noticed that Amazon sells 32 oz bottles of Nielsen-Massey Vanillas Madagascar Bourbon Vanilla Bean Paste for $28! What a bargain! I've been paying about $10 for 4 oz. It is a lot of vanilla bean paste but it keeps forever. I use it instead of regular vanilla all the time now. Toss all ingredients together in a large nonreactive bowl. Cover and leave at room temperature at least 2 hrs prior to serving. Refrigerate leftovers in a nonreactive container. 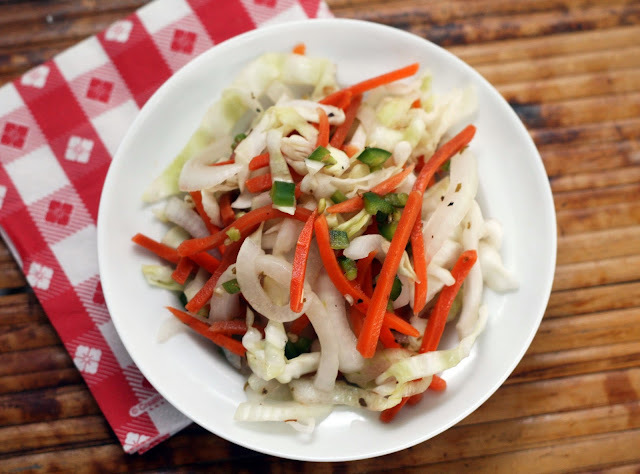 Curtido is a Salvadoran dish that is sort of like a cross between sauerkraut and cole slaw. It combines cabbage, carrots, onions and peppers. I used serrano peppers but other hot peppers would work as well. You can ferment curtido for days, some recipe call for fermenting even weeks, but I made enough for a meal of pupusa and let it marinate just a few hours. It was just as good, I think, just a little fresher tasting than the long fermenting kind. You can serve it as you would cole slaw if you'd like, I'm sort of picturing it on a spicy burger. Heat a small amount of oil in a large skillet. Saute the peppers, onion, garlic, and carrot until the onions are soft and translucent. Add the beef. Brown, breaking up large chunks until nearly fully cooked. Add the tomatoes, spices and beans. Simmer until warmed through and the liquid is nearly completely evaporated. Stir in the pasta, cook 1-2 minutes. Sprinkle with cheese. Serve immediately! I had never heard of chili mac until a quick trip down South years ago. I didn't try any, but I was tempted. I love chili, I love mac and cheese why not combine the two? I already enjoy Cincinnati Chili which is served over spaghetti so the idea of chili and pasta wasn't foreign to me. Anyway, I didn't give chili mac much thought for years until I was reading a ton of restaurant menus trying to decide on which restaurant to go to dinner last week and came across a fancy farm-to-table version with lots of local cheddar. When I saw that ground beef was on sale I thought it was kismet. Finally, it was time to make chili mac! Plus while warm, it has been overcast and rainy--perfect chili weather. I've been trying to use up the Hatch green chiles I froze last fall before the new season sneaks up on me so I thought they'd be the perfect addition to a spicy, smoky version of chili mac. If you didn't freeze the chiles last year, I've seen them available canned at the supermarket. I added fire-roasted tomatoes and naturally smoked spices to up the smoky profile. 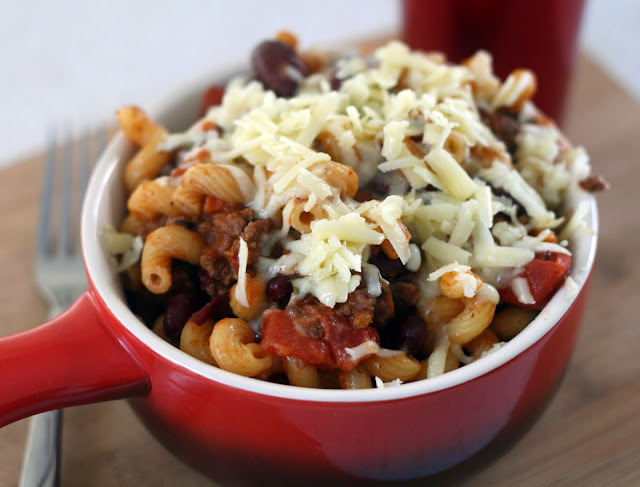 Think of it as the sophisticated chili mac. Place the strawberries in a nonreactive container (like a glass jar) and cover with vinegar. If your strawberries are very large, you may need to add additonal vinegar to fully cover the berries. Refrigerate at least 3 days and up to 1 week. The day before or at least 4 hours before you would like to make the shrub, place 2 teabags in a heat safe container (I used a quart jar) and pour in 3 cups of boiling water. Allow to seep 3 minutes. Remove the teabags and discard. Allow the tea to come to room temperature and then refrigerate until cold, about 4 hours. Remove the fruit mixture from the refrigerator. Place a metal sieve over a bowl and mash the fruit with a potato masher until well mashed and nearly smooth. Whisk the mashed pulp through the sieve until only the pulp that absolutely will not be forced through the sieve is left. Discard the pulp. Stir the tea into the vinegar mixture. Add liquid turbinado sugar. Serve until dissolved. Taste and add additional liquid sugar to taste, as needed. 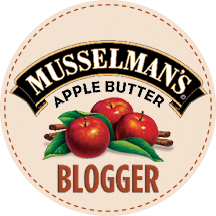 Pour the resulting liquid into a nonreactive container and refrigerate until ready to use. Serve ice cold, with or without ice. Tetley invited me to create an iced tea drink using their new Black & Green tea (as one might guess, it is a mix of black and green tea leaves) to win a chance to go to England. To be a bit cheeky, I decided to make a drink that combines the English love of tea with my favorite American colonial drink, the shrub. Shrubs are an early, DIY version of soft drinks and are easily made at home by combining fruit and vinegar. There are several methods to making shrubs, but my favorite is made by marinating raw fruit which I think gives it a fresher flavor than shrubs made by cooking the fruit. It is best to use in-season, fresh strawberries for this shrub. This is a little different than the shrub I made last year; the tea mellows the vinegar flavor and unlike traditional shrubs, you don't have to add water or club soda to serve, it is pre-mixed and ready to go! I made a small batch (no room in the fridge) but this recipe can be easily doubled or tripled or even quadrupled to make a drink for a crowd. It is a great introduction to shrubs for the vinegar drink-wary thanks to the addition of familiar iced tea. 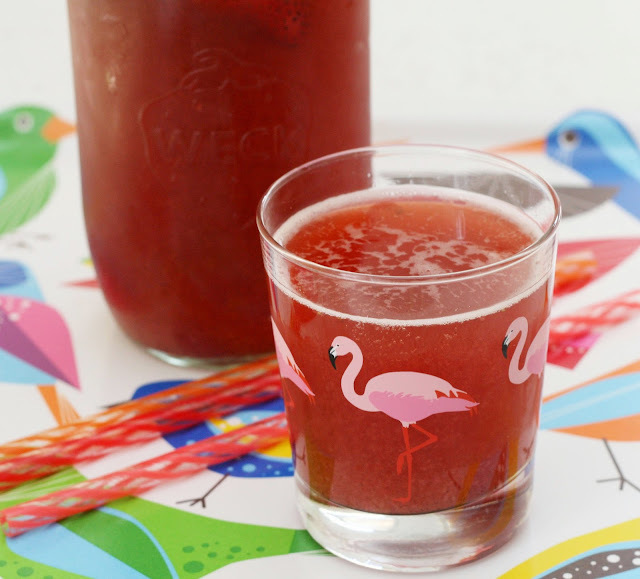 It is slightly bubbly thanks to the light fermentation of the berries as they soaked in the vinegar. As for the flavor, it almost like a brighter tasting, strawberry Arnold Palmer (or as we call lemonade-iced tea drinks in Baltimore, a half and half). Perfect for a hot summer day in Baltimore or London! 36 hours before you want to make the cakes: Place the cod in a bowl of cool water. The cod should be fully covered. Cover with a lid and refrigerate. Over the next 36 hours change out the water periodically (we did first thing in the morning, lunch time, dinner time and before bedtime). 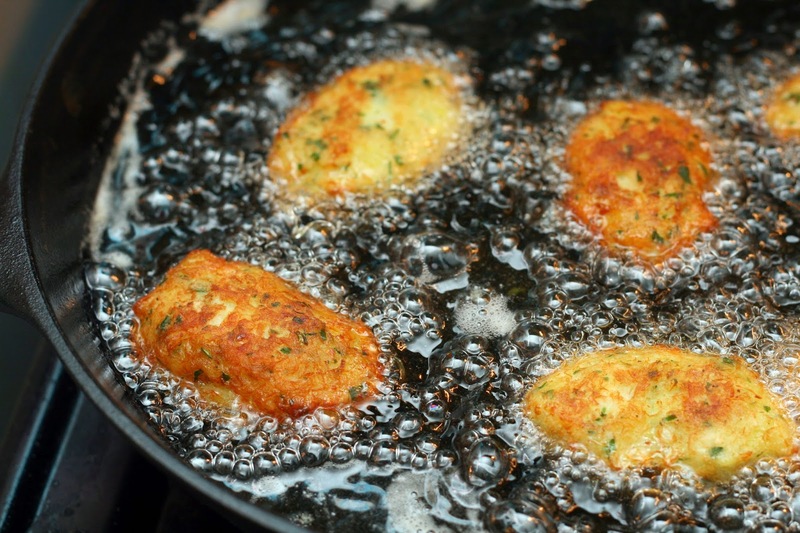 When ready to make the cod cakes, bring a large pot of water to boil. Add the potatoes and salt cod. Boil the cod 10 minutes then remove from the pot. Set aside. Continue cooking potatoes until fork-tender. Meanwhile, once the cod is cool enough to handle, de-bone and de-skin it. Lightly pulse the cod in the food processor until thin shreds form. Place the cod in a medium bowl. Slip the potatoes out of their skins. Mash them until smooth in a small bowl. Add to the cod. Stir in remaining ingredients. Form into quenelles (small, 3-D ovals) about 2 inches long; 1 inch thick, using two (silverware) tablespoons or your hands. Drop in hot oil and fry 3-5 minutes or until golden brown, flipping as needed. Repeat as needed. Drain on paper towel-lined plates. *you could do this in a food processor. After a LONG trip to Portugal (delayed flights, multi-hour sits on the runway, being re-routed through England) we arrived and the first thing I ate was pastéis de bacalhau (as they are known in southern Portugal or bolinhos de bacalhau in the North), a codfish cake. This is funny if you are from Baltimore where we have coddies, which are also a sort of codfish cake. I went all the way there to eat something I could have at home. Not quite. 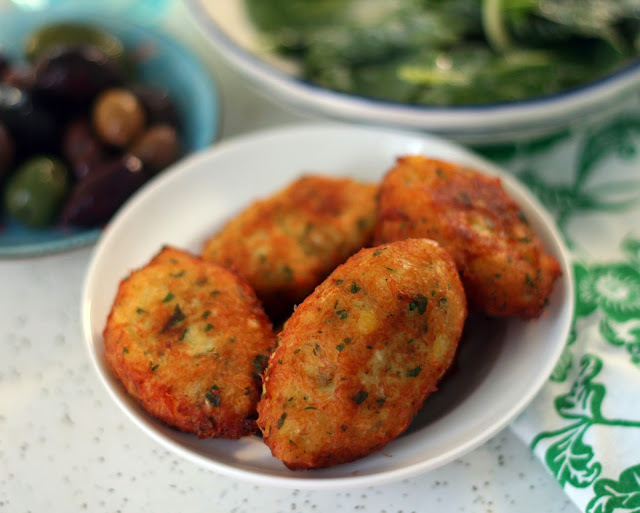 The Portuguese codfish cake is oval shaped (the typical quenelle shape) and quite light inside while Baltimore coddies are solid disks, coated in bread crumbs and heavy on the potato, that one eats with mustard and saltines. Both use dried salt cod which is fairly easy to find here, in Baltimore most grocery stores have it but if you can't find it there, a good Italian, Portuguese, or Spanish store would sell it. The Portuguese are crazy for salt cod, but I loved best in pastéis de bacalhau/bolinhos de bacalhau. I realize it takes a bit of dedication and perhaps craziness to soak salt cod for 36 hrs, de-bone it, flake it and form it into what is essentially a snack-bar snack but it is amazing tasty and the steps, while time-consuming, are simple. We had them often as an appetizer (some restaurants serve them--hot or cold--on the bread, cheese and olive plate that is ubiquitous) but since we are home, we had them as a simple meal along with a variety of olives, bread and salad. The perfect cake has a crisp outside that gives way to a creamy, cod-flecked filling. I think this is it.